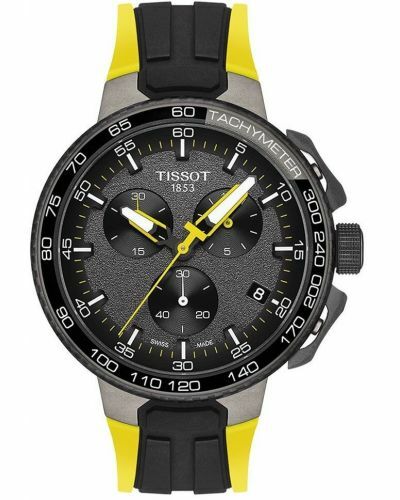 This remarkable men’s watch is brought to you by Tissot as part of their T-Race Moto-GP collection. This limited edition watch has been crafted specifically for the 2018 Moto-GP and has been produced in a run of only 3333 worldwide. 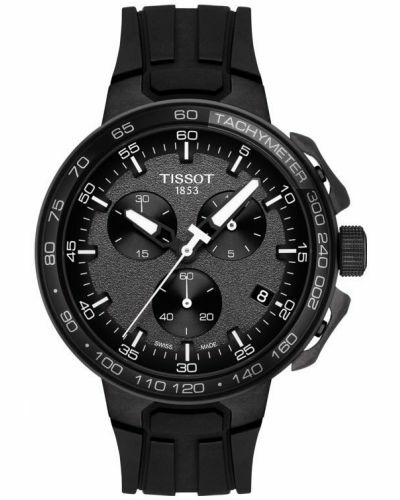 An amalgamation of Swiss craftsmanship and influenced by motorsports, this watch features a black resin strap with a tyre tread inspired design and textured center stripe this strap is fastened by a secure deployment clasp. 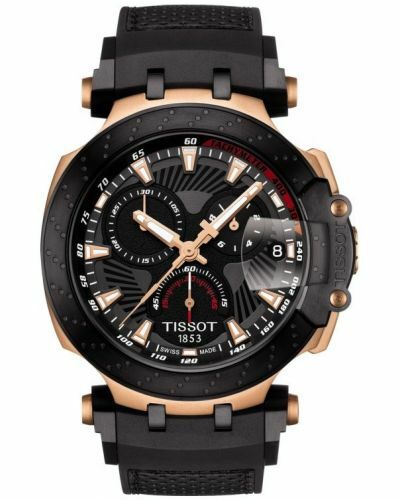 The matte black stainless steel bezel and 45mm rose gold plated stainless steel case draws inspiration from the brake discs of a motorcycle, complete with engraving and numerical markers. 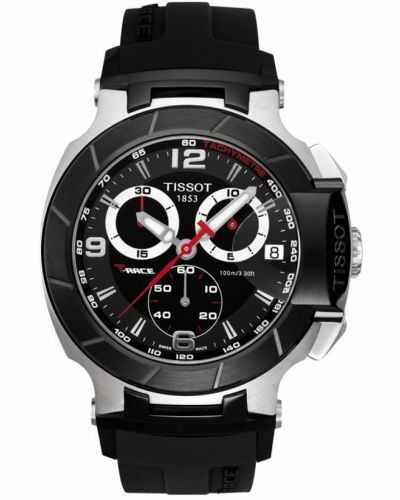 True to form the grey dial pattern is reminiscent of bike treads, a subtle nod to the sporting inspiration. 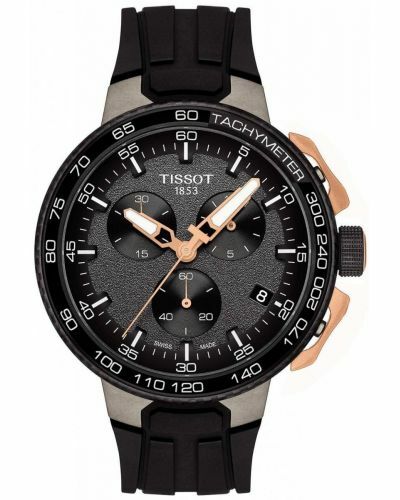 A true design masterpiece; this watch does not sacrifice functionality for style; the dial is complete with three sub-dials highlighted in crisp white demonstrate chronograph technology, a 60 minute timer and a clear date display window in which has been emphasised by the magnified sapphire glass window. The inner dial presents with Tachymeter indicators allowing the wearer to determine speed of movement via the distance travelled. Large rose gold with white batons and a synchronistic rose gold seconds hand complete the dial. The reverse of the watch case reveals the inner C01.211 Caliber automatic movement; this has been superbly encased in rose gold plated stainless steel with skeletonised sections designed to look like the spokes of a motorcycle wheel. 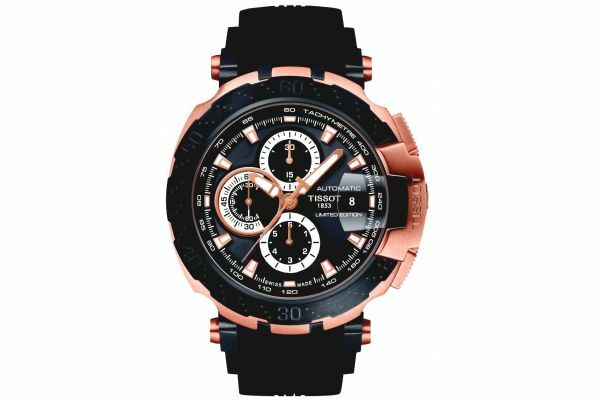 Protected by scratch resistant sapphire glass and powered by Swiss Automatic movement with a 41 hour power reserve once fully wound, this watch is water resistant up to 100 meters. 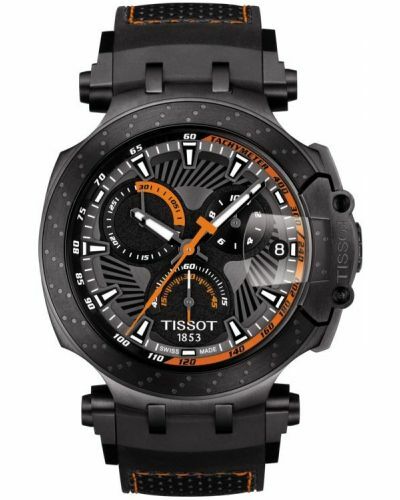 The Tissot T-Race MotoGP Limited Edition Sports watch is beautifully presented in a motorcycle helmet display case. 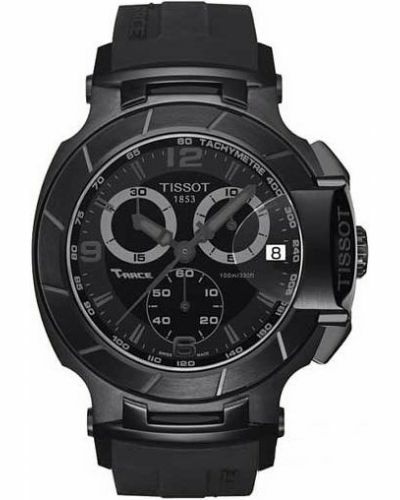 For us to size your new Tissot T Race watch as accurately as possible, please take a look at our downloadable Watch Sizing Guide.